Description: Catnip is a perennial herb of the mint family. It has a square, hairy stalk with heart shaped leaves and scalloped edges. Aromatic Scent: Mildly floral with a rich herbaceous scent. 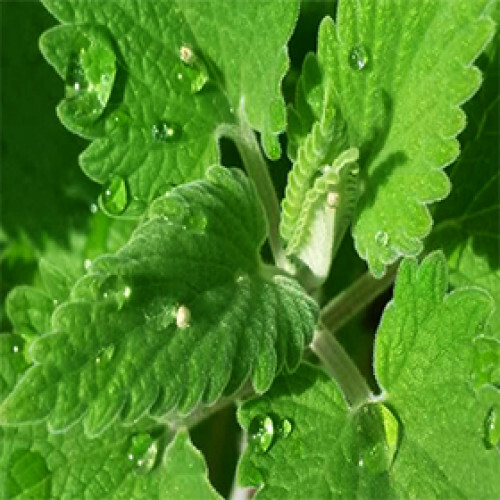 Common Uses: Catnip Essential Oil is used for trouble sleeping (insomnia); anxiety; migraine and other headaches; cold and other upper respiratory infection. ; and gastrointestinal (GI) upset, including indigestion, colic, cramping, and gas (flatulence). It is also used as a tonic, for increasing urination, and for starting menstrual periods in girls with delayed onset of menstruation. Some people apply catnip directly to the skin for arthritis, hemorrhoids, and as a compress to relieve swelling. In manufacturing, catnip is used as a pesticide and insecticide. It is thought that the chemicals in catnip have a calming effect. History: Since the 15th century Catnip has been used in herbal remedies. Prior to the importation of teas from the Orient, it was the most widely consumed beverage in Europe, used also as kitchen aid and stimulating medicinal herb.